Frank, Arthur, Freddie and Edgar Stooke were four brothers all killed in the First World War. Theirs is one of the many extraordinary stories of families who lost so much. Their father John was the head teacher of the school in Essendine at the end of the nineteenth century. He and his wife Christiana raised twenty children, 16 of their own and then they took in John’s brother’s four children when they were orphaned. Arthur, Freddie and Edgar all were born in Essendine. 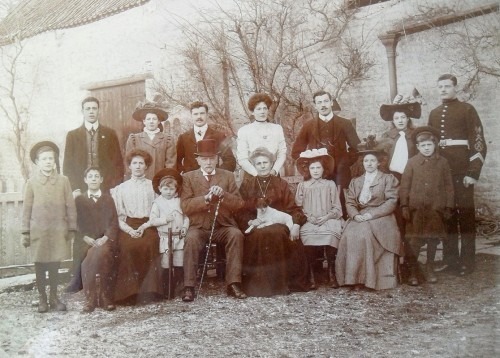 When their father retired the whole family moved two miles down the road to Carlby just over the border in Lincolnshire. John died in 1910 and their mother became the landlady of the village pub, the Plough Inn. Frank had joined the army in 1902 and served eight years before he returned back to Rutland, got married and had three small children. During the war all four, along with three of their brothers, enlisted and went abroad. Frank was the first to die – he was killed in May 1915 from a bullet wound. Arthur sent this christmas card to his family while with the army in Ireland during the war. Arthur was in the Royal Flying Corps and died in January 1917. He is remembered on the special flying memorial at Arras. The youngest two brothers Freddie and Edgar, who was also known as Edwin, died less than a fortnight apart. Freddie was just 20 years old when he was killed on 13 April 1918 and is pictured here. Edgar was just 18 when he was killed near Ypres on 26 April that year. Edgar is pictured below standing beside his brother Harold (seated) who also fought in the war but returned home and lived to be 90 years old. Despite the many years that the family lived in Essendine, they are not remembered on the war memorial there. However there is a memorial tablet to the four boys in St Stephen’s church in Carlby. The men’s mother Christiana, who lived until 1940 is buried in the churchyard there within sight of the memorial tablet.